Globally, nearly 70 billion animals are farmed annually for meat, milk and eggs. Two-thirds of these are farmed intensively. The views held by food companies on animal stewardship, and the management practices and processes that they adopt are, therefore, of critical importance in determining the welfare of these animals. Yet, despite the scale of the food industry’s impact, farm animal welfare remains a relatively immature management issue. There is a lack of consensus around the specific responsibilities companies have for farm animal welfare, and around how companies should treat the animals in their or in their suppliers’ care. 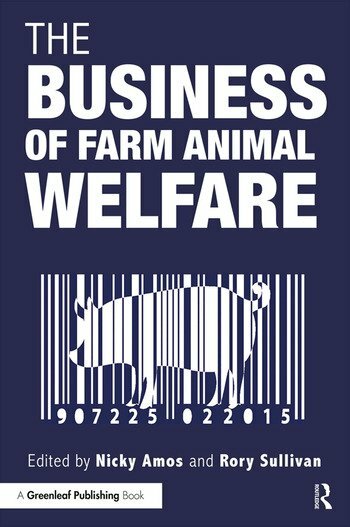 This book, The Business of Farm Animal Welfare, provides an extensive, authoritative analysis of current corporate practice on farm animal welfare. It critically reviews and assesses the ethical and business case for action. Through a series of practitioner case-studies, it describes how companies have addressed farm animal welfare in their operations and supply chains. It analyses the key barriers to companies adopting higher standards of farm animal welfare, and offers a series of practical recommendations to companies, consumers and policy makers on the role that they might play in raising farm animal welfare standards across the food industry. As the first comprehensive account of business and farm animal welfare, this book is an essential resource for researchers, practitioners and general readers looking to understand and influence corporate practice on farm animal welfare. Nicky Amos is the Executive Director of the Business Benchmark on Farm Animal Welfare. Rory Sullivan is Expert Advisor to the Business Benchmark on Farm Animal Welfare.